Some time ago, a work colleague and I were discussing our leadership development work and how to keep it fresh and relevant, she said to me that her way of doing this was to live on the edge. I thought she meant taking risks and living adventurously but actually what she meant was understanding where her comfort zone ends and doing things to stretch herself into her potential or what we may call our learning zone. Most of us have routines and habits that we practice daily, weekly and annually. We may even be unaware of some of these habits because they are so engrained in our lives. However, some of these habits serve us and some limit us. So stepping out of our comfort zone is a way of reviewing these habits and testing out our untapped potential. To develop leadership, I believe the starting point is to look at how you lead yourself and in particular how you lead yourself in challenging situations. Every 2 or 3 years I step out of my comfort zone by doing something that challenges me physically, mentally and emotionally. 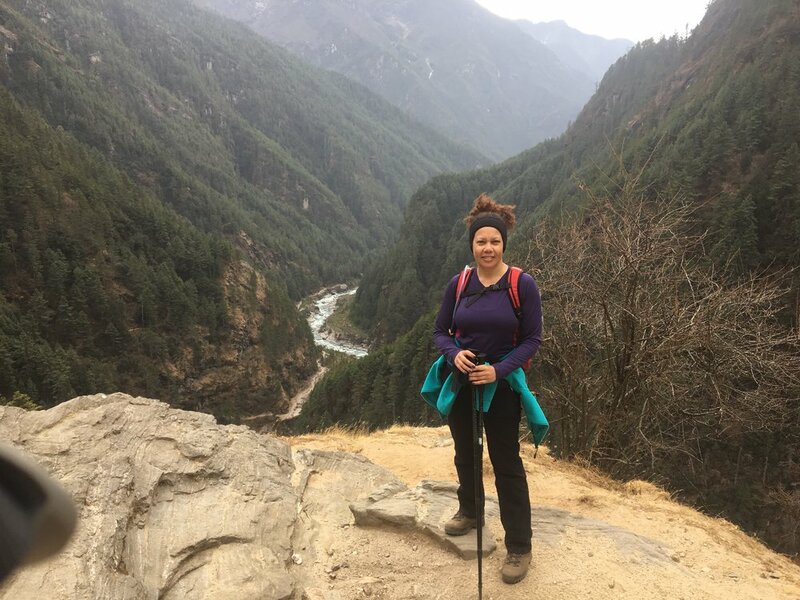 I have just come back from a 21 day trip in Nepal with a girlfriend hiking up to Everest Base. We knew it would be a challenge but nothing prepared me for the reality I met once there and it was up to me how I managed myself in order to, not only cope but also get something enjoyable out of the experience. This article is a summary of what I learnt and how I coped when out of my comfort zone. We all have a pace that we feel comfortable with when it comes to living our lives, this pace is revealed for example by how fast or slow we talk, walk, breath or how long we stay focused on one thing at a time. In the Himalayas we were walking for between 4 and 10 hours everyday. Doing nothing else but walking, and as I went higher in altitude I was forced to walk slower so I wouldn’t be out of breadth due to less oxygen. Each person in the group found their own pace. As we went higher, I found that I focused more on each step rather than our destination. The repetitive routine allowed me to be more mindful of what I was doing in the moment. Sometimes I would stop and just take in the incredible beauty of the scenery around me and become overwhelmed and humbled with how small I am as a human on this earth. During the first few days myself and the rest of the group were very aware of what wasn’t available to us that we could access easily back home, like, electricity, running water, heating and most importantly sit down toilets with a flush. But as the days went on I noticed that I started to appreciate what was around me and was grateful for whatever I received, whether it was porridge again in the morning, or a warm bottle of water to use as a hot water bottle at night. 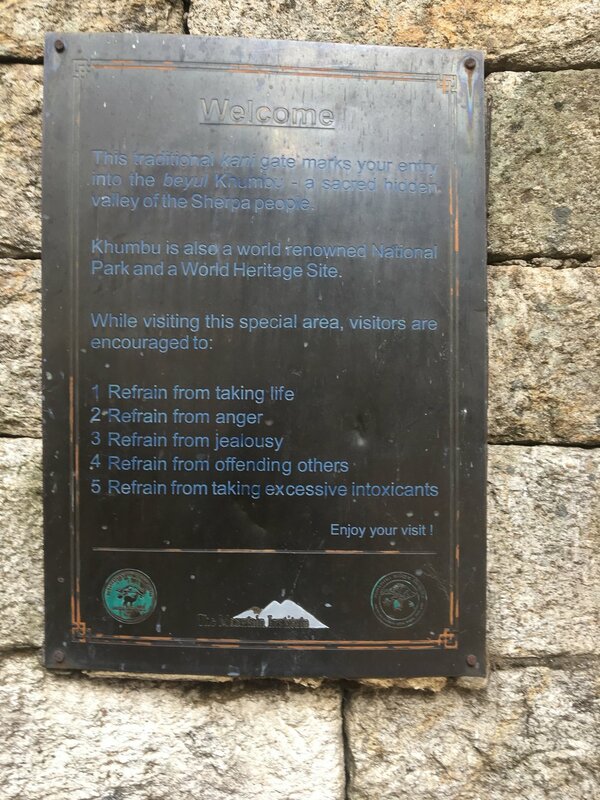 I also appreciated how the people in the Himalayas live and the rich culture and tradition that they have which our Sherper guide explained to us. I also noticed the real integration of how they live with nature and animals and their religious beliefs and values. What we focus on becomes our reality, so I knew if I became upset and was missing what I didn’t have, I would feel worse emotionally. Martin Seligman, one of the forefathers of positive psychology, talks about the impact of focusing on the positive and being grateful for what is and how this can increase happiness and reduce depression and stress. As we got used to our routine which was the same everyday, wake up at 6 or 6.30, pack your bags and be ready for breakfast at 7 which consisted of porridge then egg and toast. Start walking at 8am to next village higher up. Walk continuously with a couple of stops, usually it was warm during the day then began to get extremely cold when the sun went down so it was important you layered up to keep warm. When we got to the teahouse where we were going to stay the night the first thing we did was sit around the stove with a cup of hot lemon to warm up. Have dinner and sometimes play games or chat before retiring early to our freezing rooms to try and sleep. The simplicity of this routine meant that it was all focused on 4 elements, food to keep us energised and warm, sleep to replenish our bodies, physical activity during the day to get us to the next destination and lastly, the social aspect of sharing how we were and trying to have a laugh. Our lives in the west are very complex and busy, we are constantly being bombarded with information and requests which we have to respond to. On the mountain, we are stripped of this “busyness” which can be very refreshing. We didn’t always have access to wifi so we became disconnected from the daily “noise” we are subjected to in our lives. Instead I listened to the comforting sound of the yak bells or noticed the piercing blue colour of the sky. Resilience is built on these for ingredients – enough sleep, healthy diet, physical activity and your social network. When I run resilience workshops in organisations, I talk about these 4 ingredients, and how attending to them can deal with stress and anxiety and people are almost disappointed that it is so simple yet we struggle to balance these four elements. On the mountain, I realised that these four simple ingredients were what kept me going. 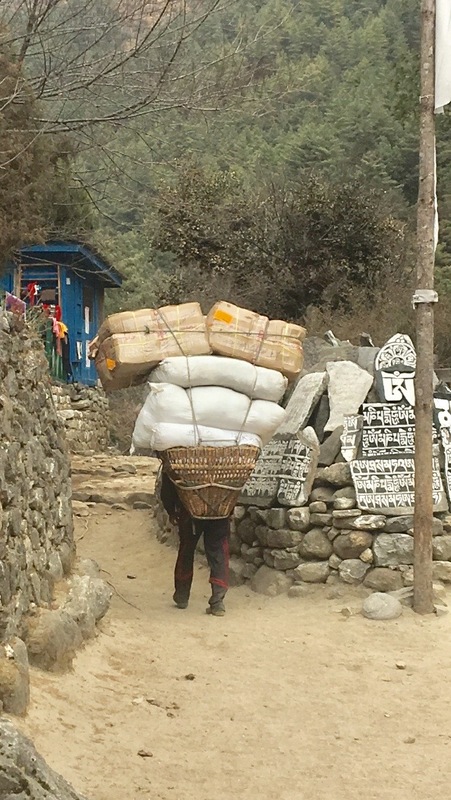 The Sherpa people are very strong people and their lives are built around these 4 activities. The biggest interference he suggests is self doubt - what we say to ourselves when doing a task that is difficult. I developed several strategies to use my mind to help me. Firstly, I chose a mantra that I said over and over again, which not only shut off any negative thoughts but also got me into a mindful state. So for example I would say to myself “my body is strong, I am strong” with each step I took and I did this for hours. I also used visualisation, when I was taking the walk to base camp at 4am in the dark at -30 degrees below zero I imagined heat from my heart spreading to each of my toes and fingers and lighting up a little flame in each of them and eventually I couldn’t feel the cold. I also used my breadth when I was getting anxious, I would inhale count to 5, exhale and count to 5 and I was amazed at how this enabled me to remain calm when we took the terrifying flight to and from Lukla – one of the most dangerous airports in the world, where members of the group were in tears or gripping onto seats and/or swearing because of fear. Nine of us signed up to do this trek, from different age groups, backgrounds and professions and didn’t know each other before this trip. Being together in such an intense experience accelerated the connection between us. What I noticed was that we were less interested in what made us different like – jobs, families and background and in fact we asked very little of that until the very end. Our conversations were very much about what we had in common and how we were coping - so we very quickly found ourselves sharing intimate details about our toilet habits, sleeping habits and who was taking the most Nurofen for their headaches. We also supported each other, by walking with different people each day who may be finding it harder, sharing kit and medicine. Each member also contributed in some way to the group, whether it be with humour, games, offer of support, or just being there. We formed a close bond by all having a similar goal and getting there in our own way. The Sherper guides also made a huge contribution to our success, but in a very subtle and gentle style. Their leadership style was about service, how they could serve us so we could all get to base camp successfully. They were flexible, kind, patient, always smiling, and consistent everyday. I know this experience will be with me forever and I am only just beginning to process the impact it has had on me. But what I know for sure is that whenever I think I cannot do something, I can remind myself that I trekked successfully to Everest Base Camp at -30 degrees on the 14th Feb 2018. "I want to challenge you today to get out of your comfort zone. You have so much incredible potential on the inside, gifts and talents in you that you probably don't know anything about."